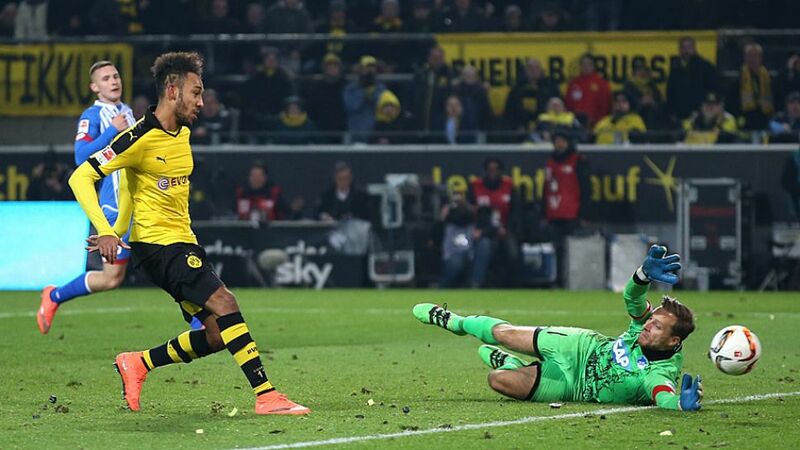 Pierre-Emerick Aubameyang remains in the race for the top-scorer's prize, while Borussia Dortmund are keeping up the pace at the top after beating TSG 1899 Hoffenheim 3-1 on Sunday, according to the Gabon international. Pierre-Emerick Aubameyang (Dortmund forward:) "I think it was really hard against Hoffenheim. They played really well and closed the gaps, so it was very, very difficult, but in the end we found the space, also because Adrian [Ramos] came on and gave me some help, which was very good. I have to be focused and the coach told me I'd have another chance [after missing one] so don't worry, stay focused and I have to thank 'Miki' of course. It's very good – we have to continue like this. I think it's never happened in the Bundesliga after 23 games to have 23 and 22 goals. Of course [it pushes me that Robert has one more]. It was very important to win this game because we were playing at home, and to stay close to Bayern." Roman Bürki (Dortmund goalkeeper): "I saved the first shot [from Volland], but we weren't ready for the rebound. But I've got to say it's my fault because I should have turned the shot to the side better. It was unfortunate because the ball then went through my legs. I always believed that we would win, though. We struggled in the first half, but we kept our cool and had a lot of possession, and then we found the right solutions in the end." Michael Zorc, Dortmund sporting director: "Illy [Gündogan] made a real impression after he came on. Overall, we created plenty of chances, but only took them late on. After we equalised, I was certain we would go on to win." Kevin Volland (Hoffenheim forward): "After the red card, it became very difficult. Up to then, we had done a really good job. We wanted to control our lead in the end. We had plenty of chances on the counterattack in the first half and if we'd made it 2-0 then, maybe the game would have gone differently. In the end, Dortmund deserved the win, if only for the amount of possession they had." Oliver Baumann (Hoffenheim goalkeeper:) "The red card was decisive. It's tough to take. We knew that Dortmund would then have chances to get through." Sebastian Rudy (Hoffenheim captain): "We fought really hard even after I had been sent off. In the 80th minute, then the pressure got to us. We fought really hard." Julian Nagelsmann, Hoffenheim coach: "We've got to build on our first-half performance. We were dangerous, even if we didn't have much possession, and we put together some good moves. If we'd gone 2-0 up with the chance Kevin Volland had, then maybe it would have been a different game. We all fought right to the end and I was very happy, particularly with the first half. When we had a man less, we were not playing the kind of football we want and when they scored from a set-piece, it opened the game up for Dortmund."